The LEVEL GRIP (Outer Rim) is a great performer, excellent for turf and dirt courses. This style was worn by JOHN HENRY most of his career, and features a high outside rim for equal traction and balance. 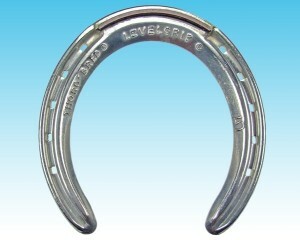 The Level Grip provides 180 degrees of good cupping action for flat-footed horses on dirt surfaces. Sold in sets.